The California Constitution allows any litigant in a civil lawsuit to demand a jury trial. This includes Unlawful Detainer actions. In order to demand a jury trial a party to the Unlawful Detainer lawsuit, either the Plaintiff or the Defendant, need only file the demand and pay the fee required by the court or obtain a fee waiver. Most eviction defense firms like BASTA, the Eviction Defense Network, Public Counsel and others of their kind routinely file a demand for a jury trial which is combined with the tenant filing a fee waiver, at the same time an answer to the Unlawful Detainer case is filed. California Courts, especially in the Los Angeles Superior Courts, have adopted new rules to deal with this growing trend. Thus, what is required in every Unlawful Detainer case according to the Rules of Court, is that both parties must prepare the jury documents, including a Statement of the Case, Witness List, Exhibit List, Jury Instructions, a Verdict Form and pre-trial motions, and must exchange those documents before or on the first day of trial. This trend has increased the cost of litigating a fairly simple Unlawful Detainer action significantly. WHAT HAPPENS IF THE LANDLORD DOES NOT PREPARE THE REQUIRED DOCUMENTS FOR TRIAL? If the parties have not prepared and exchanged the jury trial documents either before or on the first day of trial the court can dismiss the case or simply continue the court date to force compliance with its rules. This results in a delay getting the tenant out of the property. Its more expensive for the landlord because the landlord faces a situation where the case will be dismissed and will have to be refiled to get the tenant out – or will be forced to pay an additional fee for his/her attorney to make another court appearance. The landlord has probably already experienced a delay in getting the case trial and any further delay increases the landlord’s frustration with his/her attorney and with the entire court process. It is simply much cheaper and less time consuming to pay for the jury trial preparation when a landlord is required to do so than to wait and suffer the consequences. WHAT HAS CAUSED THE TENANTS INCREASED DEMANDS FOR A JURY TRIAL? There two very simply answers to this question. First, all of the publicly funded eviction litigation law firms are required by the terms of the grants they receive from the Shriver Project to demand a jury trial. So, it is economically beneficial to the tenant and his or her attorney to demand a jury trial. You will notice that when a tenant has not hired one of the indigent eviction law firms that the demand for a jury trial will decrease substantially because the tenant will have to pay for the preparation for the court date themselves. 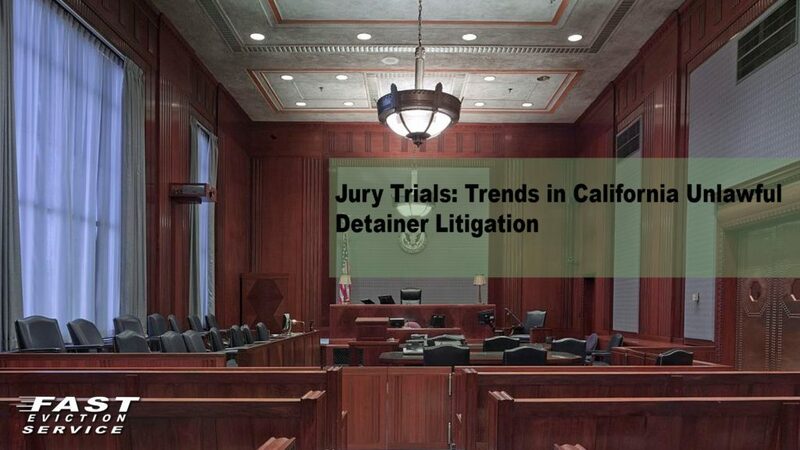 Secondly, a demand for jury trial in California significantly increases the time it gets to trial due to the increased court congestions and decrease of courtrooms available to handle the work load. WHAT CAN I, AS A LANDLORD DO, TO HELP MY ATTORNEY WHEN A DEMAND FOR JURY TRIAL HAS BEEN RECEIVED? Listen very carefully to your attorney’s instructions and heed his advice. Your attorney did not create the laws governing the tenant’s right to a jury trial in California. Your attorney feels the same frustration you do at the time and monetary consuming delay that is caused by a Jury Trial Demand. Honor your attorneys request when he or she advises you to authorize discovery to prepare for your court date as discovery is a critical component in getting ready for trial. Discovery is the process that allows each party in litigation to determine the facts and documents the other party may use at trial. Honor your attorney’s request when he or she advises you that it is time to prepare the jury trial documents. Yes, it will be expensive but the failure to do so will doom you case for failure and your tenant may be able to live in your rental property rent free depriving the landlord of the needed income to pay his/her bills and to support his/her family.